In the interest of keeping all information centralized.. The same size ID fuel tubing as the one coming from the tank vent port (filler neck) is 5/16" (7.9mm) ID fuel injection hose. I used just shy of 4 feet in length to completely replace the tank vent from the filler cap to the underside of the motor. That way I never had to fluff with any of the clamped on hoses on the canister keeping it complete. Since doing the EVAP deletion, my bike is no longer creating a vacuum in the tank, making the gas cap easy to remove when fuelling the bike. Also noted, the bike seems to accelerate smoother and is quicker to start. Hose connectors are available at any good auto parts store. I used a metal one. Wouldn't it make more sense to just replace the whole hose with a longer one? I think I spend $3 on enough hose to go from the tank down to where the other drain hoses are. That's what I did when things were taken apart. Removed the throttle body connections and filled with plugs too. However, for a fast and easy way to go, merely extending the fuel tank vent is easiest. But, I left the drain hose down to the belly pan. It would be dangerous to remove the drain hose altogether and have gas overflow drip down over a hot engine... it doesn't take that much for a full tank to overflow a bit as new gas in the tank warms up and expands. The overflow line was completely replaced when the gas tank was removed for service. Until then, it was easier to merely add an extension with a connector. EDIT: Nevermind, I believe I found the answer; it's a 5/16" gas line. The vacuum caps are 1/8", as stated above. How do I ask for the longer hose to go from the gas tank overflow all the way to the bottom of the skid plate? What are the OD and ID? Last edited by edgary; January 9th, 2018 at 06:44 PM. 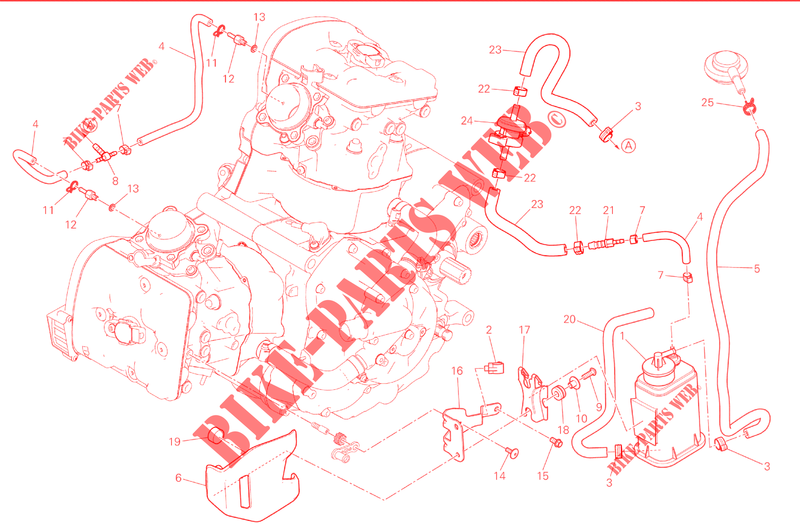 So my 2016 has an electronic breather valve in the EVAP system (# 24 in this parts diagram: https://www.bike-parts-ducati.com/th...ada-939-40.png). Does anyone know if removing it will cause the ECU to throw a code? What have people been doing with the pigtail that connects to the valve on the wiring harness? Leave the valve connected. Plug the hose.